To inquire about Land Surveying Services, please fax or email the Grant Deed or the Preliminary Title Insurance Report. A short consultation will be followed by a proposal - usually same day. The basis for most surveys is the Grant Deed or the Preliminary Title Insurance Report. 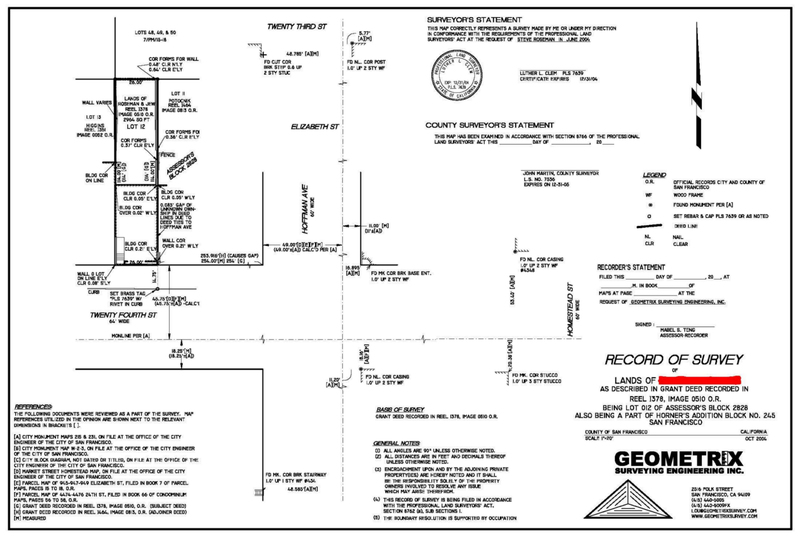 Some exceptions apply, particularly if the requested survey does not include property lines. A Flood Certificate, for example, would not require a deed or the like. Please call us at 415-422-0527 with any questions or inquiries, or send us an email at lou@geometrixsurvey.com and we will contact you within 24 hours.